Nativ Joins Roon Labs Partner Program, with a Twist. Nativ Vita™ world’s first high-resolution music player to unite Roon’s playback engine and music interface in one beautiful device. Hong Kong—May 4th, 2016—Nativ™ today announced new integration details for its Nativ Vita™ and Roon’s award-winning music management and streaming software. 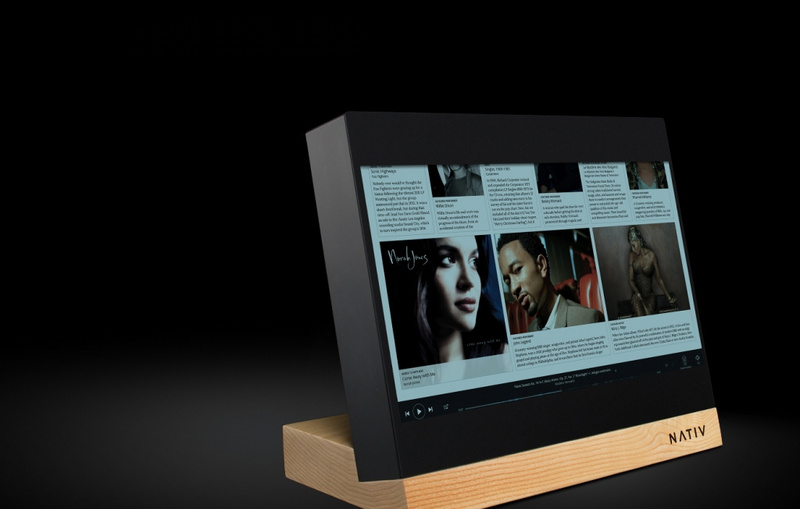 Nativ Vita™—a high-resolution music player with a stunning 11.6” touchscreen interface—will act both as a RoonReady® streaming endpoint and come pre-installed with Roon’s award-winning music interface. Nativ furthermore announced new product bundles that include a free 1-year Roon membership. Nativ’s Vita™ high-resolution music player is designed to deliver superior performance in two areas: music navigation and sound quality. Its 11.6” Touchscreen LCD with the latest IPS technology provides users with a convenient way to browse, explore and play music through the pre-installed Roon music interface*. This includes music libraries stored on a Mac, PC, NAS or Nativ Vita’s internal hard disk drives, as well as the 25 million-plus high fidelity tracks that come with a TIDAL subscription. To deliver an immersive music experience Roon scans all files in your local and streaming music library and connects it with a world of information such as artist biographies, photos, credits, reviews, concert info, and more. Customers without a Roon membership can navigate their libraries, and popular music services such as Apple Music and Spotify, through Nativ’s own beautiful user interface. Nativ Vita™ features ultra-fast 802.11ac and Gigabit technology to flawlessly stream music over the network. When used as a RoonReady® streaming endpoint Nativ Vita™ uses Roon’s own hi-resolution PCM- and DSD-capable transmission protocol, including its streamer grouping for multi-zone, fully-synchronized playback. Other wireless technologies supported by Nativ Vita™ include Bluetooth aptX®, Apple Airplay, Spotify Connect and Google Cast, giving users maximum flexibility to integrate music on their mobile devices. True audiophile sound quality is achieved through Nativ’s high-end digital output stage with independent ultra-low noise power regulators, galvanic isolation and a special in-line filter to eliminate jitter and noise from the audio signal. All music is delivered in bit-perfect quality to your A/V receiver or DAC via the asynchronous USB interface or four high-quality outputs for SPDIF and AES/EBU. Nativ Vita™ is designed for High-Resolution Audio and supports playback of DSD up to 11.2896 MHz (Quad-DSD), DXD and PCM files up to 32-bit/384 kHz. Nativ, the Nativ logo, Nativ Vita and Nativ Wave are trademarks of Nativ Sound LLC. Other company & product names may be trademarks of their respective owners. *Streaming your music from a Mac, PC or NAS through Roon requires an additional Roon membership. See www.roonlabs.com for details. Certain Nativ product bundles include a free 1-year Roon membership.